Below is the unedited, raw version of my article entitled “A Sense of Exhilaration and Possibility”, which was published on Harvard University’s Nieman Reports magazine on July 2014. It is a widely accepted fact that, throughout the history of civilization, blood, fire, energy and gluttony have been unavoidably experienced around the Anatolian geography where Turkey is situated. Just as history having indeed repeated itself probably as said, I can easily say that almost all the wars I have read in the history books have mostly been caused by such reasons. I assure you that today the subjects are different, but the fiction is the same. The only difference I have been able to observe is that the long-known idea of government, the legislative tradition and the judiciary power have also been included the media in the last century. It would be unrealistic, as you would appreciate, to state that the Ottoman society having started to use the printing press two hundred years later due to the conflicts of interests handed down a mature relation with the media. The proliferation of television channels in Turkey in the 1990s resulted in assigning the obedient journalists to the management of the newspapers as the holding representative by their owners, in hosting the popular politicians at the media bosses’ mansions leading to the dangerous flirtation between the governments and media organizations. This relationship, derailing the media out of its function to inform, has transformed it into an instrument maintaining the subsidiaries of the holdings in other sectors. Could a media giant owned by a conglomerate of diverse companies be imagined to broadcast against the government or its energy policies after having won a government tender in the field of energy? Coming into power in 2002, the AKP (Justice and Development Party) government observing today its 12th year of power began to work in less than no time in order to control that fourth power allegedly stating that it designs the politics, thus posing a threat to the national willpower. Mostly indirectly supplied messages leading the editors to be cautiously self-censoring the news were made apparently observable when the news of the anti-government republican rallies in 2007 were not intentionally broadcast, and when the protests by the state tobacco monopoly workers resulting in the greatest strike ever since the 1980 military coup taking place in the tents set up by the unions for months in the very center of the capital city of Ankara, in 2009 were ignored. At the end of 2011, in Uludere situated near the border along the Northern Iraq, the deliberate silence of the media organs followed by the murder of the 34 citizens reportedly maintaining their livelihood with the cross-border trade who were bombarded due to being allegedly mistaken as terrorists posed the most important exemplary for the young media literates as to prove that the mainstream media has completely lost its function. Experienced media professional, Serdar Akinan, having called his friends who are the chief editors of the news centers only to learn that those news weren’t deliberately broadcast due to an order received from the governmental authorities, and thus leaving his journalist identity aside, went to Uludere and sent multimedia messages through Twitter and Instagram from the scene, leading to the birth of a methodology for the citizen journalism, no matter how simple it may seem. The photographs of that bloodshed not to be covered by the mainstream media in Turkey due to their filters those days were being shared in the social media leaked through the “Earlybird” filter of Instagram. Not surprisingly at all, that’s how the 140journos counter media movement was born as a conscientious reaction in such a macroenvironment, whose story I will share with you. This unusual process which turned the passive media consumers who are in their twenties having nothing to do with news and journalism at all into “terminator” news feeders in one night was triggered by Cem’s father, who failed to compromise and empathize with the other sectors of the society, and therefore, politically conflicted with his son just because he kept ceaselessly following the contents of the same media group. Cem, trying to inform his father, with whom he was unable to communicate on some political issues, by hacking his mindset about the diverse sectors of the society, me, who tried to defend the freedom of expression in the only protest I had ever participated, and passivist conservative Safa, who has taken to Sufism teachings, having signed up for their brand new social media account as “140journos”, began broadcasting via Twitter with their first news tweets on January, 19th, 2012, the 5th anniversary of the assassination of Hrant Dink, the Turkish journalist of Armenian origin. We have created this account so as to convey the contents of user-generated newsworthy raw intelligence broadcasting real-time only from the scene destigmatizing the news language into a neutral non-political one for disseminating it on social networks. With this non-profit effort, we wanted to extend the happinesses and sorrows of the sectors people had never heard from to those, like Cem’s father, who live in a reality designed in the communal media framework, and have no chance of getting any news from the other segments of the society polarized against one another. Who knows that the heterogeneous communities of our geography hosting many ethnic and cultural origins, who are unaware of one another, could perhaps learn to live together in this way! Playing the truant in order to observe the political cases open to public during some weekday classes or participating in several street demonstrations of diverse groups with whose political views we symphatise or not, we would share their real-time and on-the-scene audio or video recordings or photographs. We tried to create some issues alternative to the contents of the mainstream by covering the latest news about their underreported topics ranging from the actions of leftist fractions supporting the arrested journalists to the protests of the radical Islamic marginal groups against the abortion as well as observing the publicized game-fixing cases of one of the nation’s favorite football clubs in the courtrooms. We were, then, so unaware of what we were doing and what a journalistic-sounding terminology was that the first thing we had to do was to look up in the Wikipedia for the meaning of the phrase, “citizen journalism” when we were told by Esra Arsan, an Istanbul Bilgi University academician, during the “Oda TV” case trials when many journalists were being tried that what we were doing while live tweeting unpaid set an organized practice of the “citizen journalism”. The transformation of yesterday’s passive news consumers into today’s active news producers, The young ages of the members of the group governing this formation and the fact that they weren’t the professionals of the job in the professional sense began to draw the attention of the mainstream media. Our team members were being interviewed by the newspapers, television channels, radio stations, and the university academics were studying the structure and history of 140journos. What we were doing were attributed a variety of assets by the third parties as citizen journalism, digital activism, etc. As a group of university students with no background and intention of being journalists, we found it difficult to interpret these matters. Unintentionally, we seemed to have undertaken the media’s mission of informing the public. 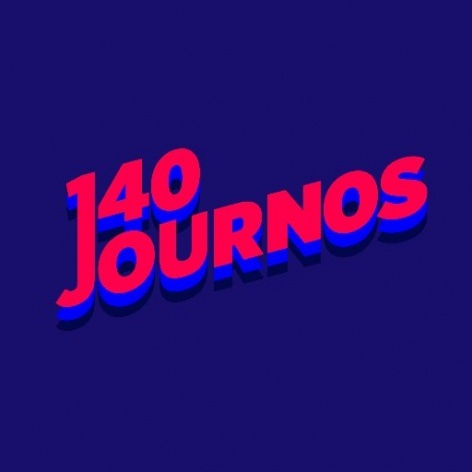 In 2012, when Zeynep Tufekci, a UNC academic, whom we met at a panel, described the practice of the 140journos project after listening to how it works not as “citizen journalism”, but as “journalistic citizenship”, we all noticed that we were mistaken with the methodological sense of the approach and with the fact that the system should be upside down. Along the process, however constructive discourse we tried to expand the idea of news production from the scene as a volunteer network of citizens with, we failed. In Turkey, it is almost impossible to create a movement unless the chips are down. It was highly probable that self-censorship of the media hadn’t become a matter of priority for a large part of the country yet then. Precisely just in this sense, the Gezi Park events experienced in May and June 2013, which has been the largest civilian uprising in the history of the Republic is an overnight revolution in many respects. Starting from our experience so far, it can be said that the Gezi Park events serve as a milestone in Turkey within the scope of citizen journalism with its current meaning in the media, which leads us to the classification of the three characteristic periods of the Gezi Park events as before, during and after the events. The fact confronted and the trauma experienced by the White Turks composing the majority of the nation’s population that state terrorism, police violence, disproportionate use of force and media censorship then experienced by the Kurdish citizens for years in Turkey’s eastern and southeastern regions had taken place in the middle of a metropolis like Istanbul that time constituted in one night the favorable conducive atmosphere and awareness that were expected to take place by the call and announcements of 140journos in an artificial way months prior to the events. The announcements shared by the civilian initiatives at the very start of the protests as to the fact that the media was dead and wasn’t able to fulfil its function properly and appropriately received positive reaction this time from the public unlike all the other efforts, and 140journos, relatively more and better prepared for this type of incidents, was pushed to the forefront in terms of coordinating the news circulation. Before the Gezi Park actions, while about 400 individual contents were being produced a month routinely, after the outbreak of the actions, during June 2013, a total of 2218 singular validated contents proven at least with one photograph, audio or microvideo recording have taken place in the 140journos accounts. While all these were happening, the number of followers of 140journos in the social media has increased six times more than the initial number and the Klout value indicating the credibility of the account increased. The activity characteristic of the project during the actions of protest changed from reporting from the scene to collecting, categorizing, validating and storifying the news contents sent to 140journos at the desktop in order to economize better on the human resources. In other words, academician Zeynep Tufekci’s criticism, even for a delay of one year, was put into practice in 140journos. In addition to the extensive broadcast through Twitter and Soundcloud during the Gezi Park events, almost all other alternative media tools and platforms such as Facebook, Storify, Vine, Instagram, Prezi, etc. were used as well as tools like Topsy, Tineye, Google Image Search, Google Maps, Yandex Panorama and Internet-accessible traffic cameras of the municipalities for authenticating the information received. After the protests ended, social opposition has kept coming up constantly changing its form to maintain its existence often as in the form of creative street actions being confronted with throughout the time so far. After the evacuation of the park in June 2013, a new era in the medium of citizen journalism defined by 140journos was entered. 140journos, turning to the work of verification and curation, began to list contacts and establish close online and phone friendships with the individuals who regularly produce content on the account through Twitter with reference to the cities and regions staying in contact with them in daily life. The project today has 300 volunteer content producers, most of with whom we have personal contacts as well, in many different locations of Turkey. The high ranking media censorship in the Gezi Park events and one of those events caused by self-censorship were also the embodiment of the pirate journalism through the social media. In Turkey, some professional journalists already permanently employed in the popular news channels like NTV, CNN Turk, Haberturk, SkyTurk 360, 24, News A, thinking that they can’t practice their profession through which they have acquired their intellectual background after the schools from which they were graduated, contacted 140journos and stated that they would like to share their capacity to access the news which they could gather (through their live broadcast vehicles, the vehicle’s internet connection, cameras, intelligence sources, multimedia data or information to verify the reported newsworthy content) in order to share their content by means of pirate ways over the 140journos because of the self-censorsip on their own stations. This information, which they think won’t be used by their responsible editors in the newsrooms, mostly consisted of opposing content. The contribution of the pirate journalists to the live tweeting news broadcast of 140journos especially during the actions of Gezi Park was incredible in size. The quality photographs above the average of citizen journalism were serviced to the public, and some issues such as verification of the news were often supported by professional pirates. The actions during the Gezi Park, just as it is said in that famous slogan, was only the beginning, and almost nothing in Turkey has ever been as before. Many partners in providing social reconciliation in the country began to look critically at any content serviced by the media. Significant increase in awareness about citizen journalism was observed, and today hundreds of people we do not know have just recently begun to tweet live news to 140journos just as on the days we began to with a group of friends, and they have been producing content in social media free-of-charge participating in lawsuits and demonstrations as well. This civil disobedience in the country these days has been forcing the government to play all the trumps in their hand. Writing the article you are currently reading, what rumors have had as “a dream” as to the shutdown of Twitter for years “has become a reality” in March 2014 just as in the AKP’s slogan for the elections: “Once a dream, has now become a reality!” Turkey, so much engaged with the international public opinion, was pushed to the league of North Korea, China and Iran, where Twitter was forbidden. Upon the access to the platform by millions of people using the DNS services, the government authorities this time in Turkey have blocked the most commonly used Google DNS service. Wherever you consider the matter, it is a chilling decision. Even my mother in her 50s had to learn how to use the VPN technology also making a small-scale hacker all those who have limited access to technology and the Internet, and finally causing citizen journalism to have its share from this prohibition. The citizens of Turkey, who have to pay more even for the standard plans already compared with many European countries, now have to suffer from the unqualified low speed service provided being forced to consume the same service now censored. The unlimited editions of stable VPN software used to circumvent censorship are sold at the prices starting with $5 and more per month. The new internet law approved and enacted by the parliament late last month, however, if all this were not enough, granted the bureaucrats the authority to prevent the access to any content which allegedly violates privacy through DNS and IP-based access before releasing it to the discretion of the judges. Just imagine, under these circumstances, it is quite probable that any citizen who does not know his legal rights better would hesitate to produce content because of the current regulations. It is no doubt that having limited the freedom of expression by the antidemocratic laws has been causing the digital natives including the writer of these lines to get critical of the democratic acquisitions of the nation while growing up along with the AKP government in power. In this sense, extending the area of freedom assigns the activists, concerned citizens and citizen journos. In so forgetful a society which is devoid of the ability to practically assess the theoretical achievements of the recent history, in order to register the collective memory, we have been working on the the verification of the data accumulated in the universe of social media and the “Journos” project for an interface intended to be focusing on the users’ interpretation of the publicly available data being embedded inside the multilevel maps through one of the 140journos’s R&D studies. The mobile platform crowdsources verification of social media content, analyzes citizen news reporting, and extends the coverage of civic news will soon be introduced to Turkish internet community. As 140journos, Turkey’s popular citizen journalism network, we provide a new platform solely for Twitter users who are interested, and engaged in news sharing and reporting in this project. Operating through a mobile app, website providing maps layered with facts and datas, and social media, it applies game mechanics and data visualization to reinvent the way citizen reporting is verified, and contextualized. First, game features crowdsource and promote geo-tagged, factual, photo and microvideo-based reporting. Second, harnessed citizen data are used to display relevant background information to explicate where the specific news comes from. The app interface not only promotes verified and civic-minded citizen news, but also actively uses data to contextualize the incoming reports. As mentioned above, 140journos has an established network on Twitter where we receive thousands of tweets every day on events varying from protests to local politics. We are building a new platform, Journos, which integrates a socio-technical process for the geo-tagged and visually supported reports on Twitter to be verified and contextualized. The Journos provides users with a selection of reporting tasks to be completed that is filtered through 140journos’s social media presence and raw data. Users complete tasks relevant to them based on their location and interests. By completing different tasks, users then unlock different badges and receive points, thus gaining credibility and acquiring different editorial/reporting roles. Journos pushes citizen journalism beyond merely documenting events. Let me repeat, these are all real life events but gamified. It provides a variety of information; from environmental features of where the event takes place to the political dynamics that give insights into news. Every piece of visual evidence is watermarked by date, source, and location information through the application, therefore it becomes harder to manipulate reports. Simultaneously, the application’s interface actively encourages users to report and consume news in a contextualized manner by showcasing the overall map of the citizen news network over-layered with the local, historical, and political insights. Overall, Journos app is a feedback system for citizen news on social media; run, verified, and curated by a unique interaction of citizens and technology. We take social media content, parse and filter it, and send it back. Turkey, so far, seems to be a great place to start a journalism start-up not because it provides great entrepreneurial infrastructure and incentives but because it provides real life facts igniting, pushing forward innovators to develop better to comply with the latest information needs under an intense political atmosphere. Though 140journos has been rising in momentum due to Turkey’s agenda each day today, it is a project of the Institute for Creative Minds, which we have independently managed to maintain non-profit as of January 2012 until today. Within this network of the creative professionals, with an interdisciplinary group of 25 people, we have been designing, with the most simple words, identities and communities. In consideration of the combative reaction of the states with autocratic tendencies developed against the opposition in the streets and squares, the freedom of expression in the digital public sphere and the maneuverability in every sense can be rated higher than the ordinary democratic states. Therefore, we, at the Institute, haven’t only been developing projects of culture, art and media for digital public spaces as well as for physical spaces, but we have also been working closely with the civil society and the non-governmental organisations in addition to creating installations for the national and international biennials so as not to receive any financial support from any third party. We have never aimed at earning any money from any project to which we have no appeal for having it realized as we have no interest and concern in the topics of financially attractive maintainability since we don’t praise any project stemmed from a creative idea conceived when not demanded. It seems that our motivation probably won’t disappear easily because it has originated from a personal matter, I mean, from our personal conscience, and then, from a naive request as to hack Cem’s father’s perception. The academic concepts, expressions that define 140journos will perhaps be altered with their means in the near future, but I am confident that we still have the same anger against the media, oblivion and to all the obstacles that prevent the coexistence of all the societies, none of which have yet been pulled down. “Engin Önder is not a journalist, and he’ll be the first to tell you that. (“No way,” he said, laughing, when I asked.) Instead, Önder, who cofounded the Turkish citizen journalism platform 140journos, considers himself a citizen acting journalistically to share information and spark discussions about political issues in Turkey.” wrote Joseph Lichterman on NiemanLab. Engin Onder was a recent college graduate in 2012 when, frustrated by the state of the media in Turkey, he joined with friends on Twitter to launch 140journos. He described the early days in “A Sense of Exhilaration and Possibility,” for the Spring 2014 issue of Nieman Reports. On January 19, 140journos relaunched their site to mark their 5th anniversary, with big plans ahead for 2017, including launching an English-language service for journalism institutions and professionals. Engin partipated in our Istanbul Longform Workshop in March 2017. I am in Şırnak, one of the Kurdish cities that was under curfew for 8 months, between 14 March-14 November 2016 . 70% of the city has been totally destroyed. 8 of the city’s 12 districts do not exist anymore. The streets that I walked on before, the parks, the main square of the city, Cumhuriyet Meydanı, where I met together with the Şırnaqi youth years before, none of them exit. There are no streets left. One of the biggest districts, Bahçelievler, with a population of 12.000 has now been flattened. It is hard to believe that there were houses, shops, parks, schools and life before. It is hard for me to believe that I am in Şırnak. There has been huge destruction in other Kurdish cities; in Cizre, Nusaybin, Yüksekova and Sur as well. None of them are like Şırnak. Think about a city, that no longer has a city center! To enter the city is a different kind of hard work. It is worse than passing into another country. There was a line of cars more than one kilometer long. I waited in the car for half an hour, before deciding to walk. I walked to the control point. What I saw was, a control point like that of a border! Hundreds of police, army, tanks and barbed wire fences… After the barbed wire fences there were four booths like at the borders. The policemen were checking identity cards inside the booths. After passing another barbed wire fence, I finally entered Şırnak 1.5 hours later. Şırnak, one of the main Kurdish centers was burnt in 1992 by the state. Hundreds of people died, more than 20,000 people were forced to migrate. After 24 years, in 2016, Şırnak was again destroyed by the state. Before the curfew, the population was 64,000. Now the population is 30,000. 50,000 people are homeless. There are no residential areas left in Şırnak. Thousands of people live in tents and have migrated to rural areas, while others are left to live in overcrowded conditions, several families living together in the few houses that are left standing. I have learned that the state has blocked all kind of aid to Şırnak. 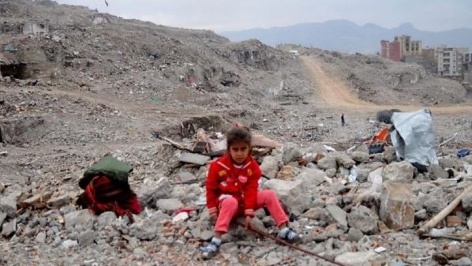 There is no interest from NGOs , aid organizations, media and international organizations in Şırnak. The city is totally isolated from the outside world, left alone with it’s ruins and pain. I can’t help but wonder: Is Şırnak really one of the 81 cities of Turkey? Just 3 weeks ago, the cafeteria manager of Cumhuriyet newspaper said that he would not serve tea to Tayyip Erdoğan. He was immediately taken into custody after the police raided his home. Authorities said that he was arrested for insulting the president. In Turkey, insulting the president is a crime punishable for up to four years in prison. There are more than 1,800 cases against people including cartoonists, school children, journalists and writers all accused of insulting Erdoğan. President Erdoğan and members of the government often make statements that “you should report the people who insulted Erdoğan”. Last month, a taxi driver recorded the voice of his passenger who “insulted Erdoğan”. He sent the recording to the police, who raided the home of the passenger. Moreover, just a few days ago the village headman (muhtar) of the Cemilli Village in Mersin, a Mediterranean city, filed a criminal complaint against 18 villagers for “insulting Erdoğan”. Investigations have been opened against the villagers. It is not surprising to hear court cases like: “I killed my wife because she insulted Erdoğan”, “I killed her because she was a member of FETÖ” or “I want a divorce because my wife does not like Erdoğan”,“my wife is supporting PKK terrorists”. The parliament is one of the main characters in this soap-opera. Last week, a parliamentarian from CHP, the opposition party, called the Prime Minister Binali Yıldırım “Cin Ali”, a popular cartoon character in children’s books, due to his speech about the constitutional change. During the constitutional change process parliamentarians have fought with fists, but last week, during these fights, one of the AKP’s parliamentarians claimed that his leg was bitten by an opposition parliamentarian. The other day, AKP parliamentarians hung up papers inside the parliament which had written, “dogs cannot enter”. A few days later, a CHP parliamentarian who is also a doctor gave a detailed medical speech with x-ray films and claimed that the bite was not a human bite but a bite of a horse! Yesterday, we watched the drama of this soap opera unfold. The AKP party has been pushing for constitutional changes to bring about a presidential system, likely to be put to a public referendum in early spring. During the parliament sessions regarding constitutional changes, an independent parliamentarian Aylin Nazlıkaya, handcuffed herself to the speaker’s microphone. She challenged the MHP parliamentarians to change their position and vote against the upcoming presidential system to protect the republic of Atatürk. After many hours, Nazlıkaya remained standing. Women parliamentarians from the AKP party came to remove the handcuffs. Unable to do so, they removed the microphone. At this point, physical violence broke out. CHP and HDP women parliamentarians stepped up to protect Nazlıkaya from these beatings. Two of these women were sent to hospital. The country is like a dark comedy. The most useful term of this dark comedy is “terror”. Everyone uses this term for their own interests. Just 4 days ago, Erdoğan said the Turkish economy is also under a “terror” attack. He said that “there is no difference, where aims are concerned, between a terrorist with a gun and bomb in his hand and a terrorist who has dollars, euros and interest rates”. He also asked citizens to continue selling dollars and euros to counter the threat. After Erdoğan’s speech against the boost of the dollar value, a group of village headmen in Adıyaman protested the dollar by cleaning their noses with dollars and burning them. The destructive language that the political leaders are using is causing tragic consequences on the society. Just a week ago, Alper Engeler, a famous psychologist was killed by a local shopkeeper. Engeler had built a small house to protect the cats from cold snow. The shopkeeper and Engeler quarreled, resulting in the shopkeeper killing Engeler. Last year, journalist Nuh Köklü was killed by a shopkeeper after a snowball accidentally struck his shop window. In his many speeches to local shopkeepers, Erdoğan stated that “when needed do not hesitate to use guns”. Turkey, maybe worse than a soap-opera! Nurcan Baysal is a Kurdish activist and writer. She was born and grew up in Diyarbakır. She graduated from Ankara University Faculty of Political Science. After 1 year assistantship at Bilkent University, she returned her homeland Diyarbakır and began to work for humanitarian issues in the Kurdish Region. Between 1997-2007, Baysal worked as the project coordinator for United Nations Development Program in Diyarbakir. During that time she was active in poverty and development issues as well as in microfinance and women’s entrepreneurship. She was engaged in the establishment of a number of NGOs in the Region. She was part of the Kurdish women’s movement and a big supporter of women NGOs in Kurdistan. In 2000 she established the Development Center Association and worked for the rights of the forced migrated Kurdish population, evacuated villages, the rights of returnees and rural development. In 2008, she began working for the Ozyegin Foundation and developed a rural development program in 6 war-torn villages of Tatvan, Kavar. The program made a significant impact on the living standards of over 2,000 people through projects working on education, employment, health and social life. As a result, Baysal was selected as one of “Turkey’s Changemakers” by the Sabancı Foundation in 2012. Baysal was awarded the “Women’s Creativity in Rural Life Award” by the Women’s World Summit Foundation in Switzerland for her work in the Kavar Basin and for her contribution to development literature by linking development with happiness. As she said in an interview “happiness is part of development”. In 2012, with a group of Kurdish and Turkish intellectuals, activists and academics, she established the Diyarbakir Political and Social Research Institute (DISA). DISA has conducted research on different aspects of the Kurdish question including education in mother tongue, reconciliation, paramilitary forces, disarmament and more. Baysal serves as an advisor or board member to many non-profit organizations, like the Global Fund for Women, the Women Labor and Employment Platform, the Urgent Action Fund, the Mezopotamya Foundation, the Platform to Save Women Kidnapped by ISIS. She is a member of the women’s movement and several peace movements in Turkey. After ISIS attacked Şengal in August 2014, Baysal immediately began to work voluntarily in the Yezidi camps in Iraqi and Turkish Kurdistan. She increased the voice of Yezidi people with her articles and with a group of brave women, she established the Platform to Save Women Kidnapped by ISIS in 2015. The platform continues to give different legal and health support to Yezidi women saved from ISIS and tries to increase the voice of Yezidi women in the world. Since 2013, Baysal has been writing as a regular columnist on T24. Her articles have been published in various countries. She is member of PEN Turkey. Nurcan Baysal is the author of O Gün (That Day), Ezidiler: 73. Ferman (Ezidis: 73rd Decree) and co-author of Kürdistan’da Sivil Toplum (Civil Society in Kurdistan). She has recently been writing on people’s voices and stories who have been displaced in demolished cities of Kurdistan. She is one of the very few reporting from inside the Turkish-Kurdish conflict, from the proud and ancient heart of Kurds living in Turkey – the city of Diyarbakir. She focuses on human rights and war crimes in her articles. Her new long-form “Those Voices” has just been published by 60pages Publishing in Berlin. In “Those Voices”, she wrote about her city that was under bombardment. How the city itself experienced the bombardment, how daily life continued under the bombardment as well as how different sections of society experienced the bombardment. “We are in the middle of a long struggle for democracy, freedom and justice. I write to record the history not written by the powerful, but to remember those who struggle for equality, freedom and justice. Nurcan partipated in our Istanbul Longform Workshop in March 2017.
kürdistan est un mot cool. your coffee-coloured hair is on my mind. yet that’s not the point. Mehmet Said Aydın was born in Diyarbakır (1983), spent most of his life in Mardin and İstanbul. The author of realities and tales of his homeland, which stayed unsung for centuries, Aydın’s poems and short stories are best known for its neo-realist texture. Aydın’s mother tongue is Kurdish and he studied Turkish Language and Literature. Published in 2011, his first book of poetry Kusurlu Bahçe by 160. Kilometre was honoured with “Arkadaş Z. Özger First Book Special Award”. In early 2014, Sokağın Zoru was released and his two poetry books were reprinted 7 times. In 2017, Sylvain Cavaillès translated his first volume of poems Kusurlu Bahçe into French as Le Jardin Manqué. He’s currently working on a novel and new volumes of poetry to be published in 2018. He translated two books from Turkish to Kurdish together with Süleyman Sertkaya: Murat Özyaşar, Bîr (Doğan Publishing, 2011); Aziz Nesin, Zarokên Niha Çi Jîr in (Nesin Publishing, 2012). His column “Pervaz” appeared first in BirGün, then in Evrensel newspapers every week since 2013. He currently writes weekly for the Duvar Newspaper. Aydın expresses the political conjuncture with a delightful sense of humour using his childhood memories and similes. He hosted a radio show on Kurdish Literature aired by Açık Radyo, every 2 weeks for 2 years. This program was popular among circles of interest that he was proposed hosting a TV show Keçiyolu which was broadcasted in 2015 and 2016. He makes a living as an editor for Everest Publishing House in İstanbul married to Selin Fişek Aydın. He experiments with language and methods of translation. He’s a member of Amnesty International Turkey and Journalists Union of Turkey. Mehmet partipated in our Istanbul Longform Workshop in March 2017. 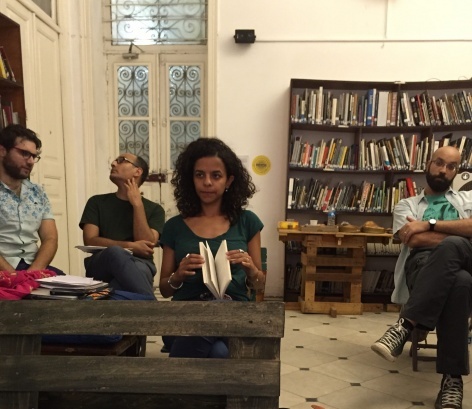 In 2015, Nora participated in our 60pages Longform Workshop in Cairo, her book “Migrating the Feminine” is an outcome of this workshop. It has been published in English and Arabic and soon in German. Sometimes I wonder: Does anybody care? And: Was it always like this? Only now I realize it? Or, on the other hand, is the world just okay with authoritarian regimes all over taking away the basic freedoms that make humans human? Like: Freedom of speech and opinion, freedom of press, freedom to assemble. It seems total control all over, and it does not help that there is an authoritarian crack-pot in the White House. Still, among all the bad bad news we heard in the last year or two, the news from Cairo about our friends at Mada Masr was as unsurprising as it was shocking. 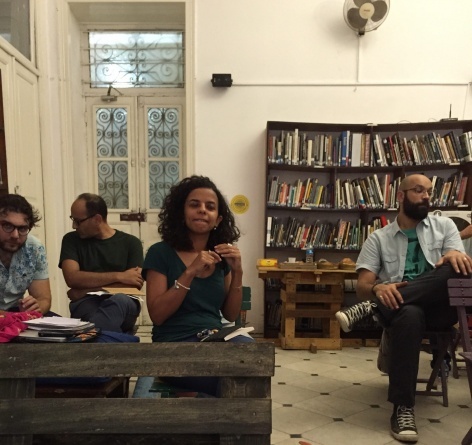 We, Murat and I for 60pages, had been in Cairo in 2015 for an extraordinary workshop about longform non-fiction writing with some of the brightest and bravest of the journalistic profession that I have ever met. I am grateful for everything they talked about and shared, among them Alia Mossallam and her friend Lina Attalah, the editor-in-chief of Mada Masr, the independent online-medium which was one of our partners at the time. The closing and finally the tearing down of the gallery space where we met was the first step that we witnessed; our friends in Cairo of course had lived through far worse, Alia Mossallam talks in her soon-to-be published text about some of the despair. There were constant reports of threats and harassments by the military regime which is tolerated or openly supported by to my knowledge all of the Western governments; it is better to have stability than human rights, that’s the rationale. But now, it seems there is another level of systematic purging of dissenting opinions: On May 24, Mada Masr – together with Al Jazeera and HuffPost’s Arabic website and others – was blocked by Egyptian authorities. Then the government of Abdel-Fattah el-Sissi effectively banned foreign NGOs – a move described as a “catastrophic blow” by Amnesty International, a “death sentence” for human rights groups in the country. These are hard times, in a lot of places, for our friends in Egypt and in Turkey where we went for another workshop in March of 2017. Our friend, the German-Turkish journalist Deniz Yücel is still in prison there. Again, really, how did we get here? In a way, I feel, all we can do is publish texts that matter.